There are 2 ways to make hardwood flooring, engineered and solid. In all our products, they are available in engineered construction or solid. Which type of construction should you choose? Engineered hardwood flooring: Generally, engineered flooring costs a bit more than solid hardwood flooring but it has its benefits and it’s worth every cent if you choose to go this route. Engineered hardwood flooring has a solid wood top that is glued to a plywood base. We use only the best plywood in the world to make our engineered flooring; Baltic birch. Each layer of ply is only 1.5 mm thick. High quality glue fastens each layer together with precision without voids. It is very stable and highly respected in the industry. When do you want/need to use engineered hardwood flooring? In floor heating : With in floor heating, heat comes from the floor to heat a space. This is usually done with hydro wiring or hydronic pipes although there are other methods used. In any case with in floor heating, engineered hardwood flooring must is used instead of solid construction. The heat from the floor puts stress on the hardwood. Engineered hardwood flooring can manage this stress and stay stable throughout the seasons. The substrate or subfloor is concrete: In this situation, engineered hardwood flooring can be glued directly onto the concrete. No wooden subfloor is needed. Very little to no board movement: Engineered flooring is very stable. In this part of the world, we have 4 seasons. Sometimes as cold as -40c to 37c. With these variations in temperature come swings in relative humidity. Wood is hydroscopic. This means that wood takes on and gives off moisture according to the relative humidity around it, much like a sponge. In the winter, despite a drop of relative humidity, engineered hardwood remains stable. In the summer, when humidity can be very high, engineered hardwood remains stable. What are the caveats to engineered hardwood flooring? Cost is usually more than solid hardwood flooring so this is a consideration. Also, the length of the boards in engineered flooring are limited to 10’. Our solid flooring can be as long as 14’. So this is a limitation but is seldom a deterrent as the lengths are still very long. Solid hardwood flooring: Generally, solid hardwood flooring is lower in cost than engineered hardwood flooring. The manufacturing process is simpler and quicker. Solid hardwood can be installed in many situations and suitable in all sorts of applications. Our solid hardwood flooring can at times have very long boards, up to 14’. Another very important consideration is what type of specie of hardwood to go with. Determining the right material is often critical when acquiring a certain look and feel. Some species are very warm in tone, while others are cooler. Some species take well to whitewashing or grey stains while others don’t take well at all. Some wood grains are simple while others are erratic and complex. Some woods do better than others when it comes to texture, dent resistance, stability, and board length and width. Explore some of the options. We are here to help guide you through the process. White oak is an amazing material and yields beautiful results. It has been appreciated for its beauty, strength, and timelessness. In Canada, white oak has been used in furniture for centuries, but it has not been used for flooring for very long. Grey elm is a unique material and yields beautiful results in flooring! In Canada grey elm has been used in furniture for centuries. In the world, elm has been used for thousands of years but it has not been used for flooring in homes until recently. 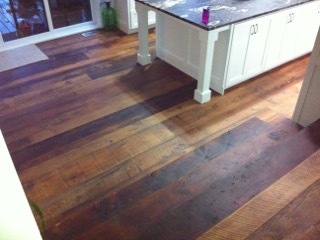 Antique reclaimed hemlock barn board flooring is a unique material and yields beautiful results in flooring! In Ontario, hemlock has been used in the flooring and walls of barns. Walnut is a unique material and yields beautiful results in flooring! There are times when nothing else will do but Walnut as it has certain traits that make it unique.Walnut flooring has a grain pattern that is fairly strong and bold. Ash is a fantastic wood and yields beautiful results in flooring! As we continue to see, it’s a great material to install in flooring applications. There is very little we can say about ash that is negative. Cherry flooring is a unique material to add to any space! There are times when nothing else will do but cherry as it has certain traits that make it unique.Cherry floors change over time. As uv rays penetrate the wood, it gets darker and richer over time. Reclaimed Rock elm is a unique material and yields beautiful results in flooring! In Canada reclaimed rock elm has been used in furniture for centuries. Hickory has traits that make it an incredible material. Hickory has been appreciated for its beauty, and strength. Hickory has been used to make furniture, carriage wheels, tool handles, ladders, sporting goods, and floors! Red maple is a fantastic wood and it’s underrated. With certain finishing techniques, it is set apart from all other woods. As we continue to see, it’s a great material to install in flooring applications. There is very little we can say about Red maple that is negative.